Dress your soul (and body!) with motivational reminders that inspire positive energy in your life. Wear these Serenity boho rings to bring a sense of peace and calmness to your day. 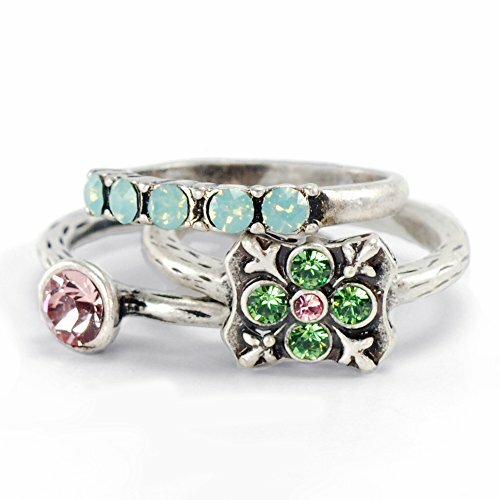 Set of 3 silver stacking rings feature Swarovski crystals in a cool pastel palette. Stack and mix with other rings to create a new combination every time you put them on! Each set of stackable rings arrives in a black velour pouch with lifetime warranty certificate. Gift a ring set to your sister, daughter, mom, girlfriend and BFF for holidays, birthday, Christmas and graduation. Rings are available in sizes 6, 7, 8 and 9. Made in our Los Angeles, CA studio by Sweet Romance Jewelry. *Note: Ring sizes vary slightly (1/4 to 1/2) to allow stacking and mixing on other fingers. Set of 3 silver stacking rings feature Swarovski crystals in a cool pastel palette. Stack and mix with other rings to create a new combination every time you put them on! Each set of stackable rings arrives in a black velour pouch with lifetime warranty certificate. Gift a ring set to your sister, daughter, mom, girlfriend and BFF for holidays, birthday, Christmas and graduation. Shop our other Inspirational Stack Rings available on Amazon by searching: Serenity Stack Rings, Longevity Stack Rings, Reflection Stack Rings, Harmony Stack Rings, Balance Stack Rings and Wisdom Stack Rings. Rings are available in sizes 6, 7, 8 and 9. Made in our Los Angeles, CA studio by Sweet Romance Jewelry. If you have any questions about this product by Sweet Romance, contact us by completing and submitting the form below. If you are looking for a specif part number, please include it with your message.